Director: Hayao Miyazaki. Animated. Voice Cast: Rumi Hîragi/Daveigh Chase, Miyu Irino/Jason Marsden, Mari Natsuki/Suzanne Pleshette, Bunta Sugawara/David Ogden Stiers, Yumi Tamai/Susan Egan, Takashi Naitô/Michael Chiklis, Yasuko Sawaguchi/Lauren Holly, Tatsuya Gashuin/John Ratzenberger, Ryûnosuke Kamiki/Tara Strong. Screenplay: Hayao Miyazaki (with English dub translations by Cindy Davis Hewitt and Donald H. Hewitt). Almost a decade after Spirited Away, Japanese animation legend Hayao Miyazaki made Ponyo, a soothingly surrealized riff on, among other things, the story of the Little Mermaid. Ponyo begins with by far its most thrilling sequence, a wordless immersion into a deep-sea world of proliferating plankton, Cretaceous fish, and floating medusas. The explosion of color and detail and the tender palette and textures are a mite precious and self-regarding in their rejection of dialogue, which has recently become de rigueur for the opening overtures of "serious" animated films. It's still a dazzling set-piece, but unfortunately its strengths do not characterize the rest of Ponyo, or not in a disciplined enough way; the movie feels about as overstuffed, desultory, and fatuous as a film can be while still being recognizable as the work of a worldwide master of his chosen form. I only bring it up now to highlight what proves, in retrospect, to form an odd chiasmus, since Spirited Away commences with almost surely its weakest sequence but, once it takes off, boy does it soar. Maybe I'm just a little weary of the introductory trope of the mopey, reluctant youngster cooped into the backseat while her half-attentive parents drive to their new home. It seems a little beneath someone of Miyazaki's weird ingenuity, and he protracts this first movement for an awfully long timeto include the family's initial penetration of some kind of abandoned fairground, which we know can only end one way. As annoying as it was to see Guillermo del Toro swipe so much of Spirited Away's opening beats for Pan's Labyrinth, you can see why such a generic opener seemed ripe for the picking, and why del Toro might have even thought he could improve upon it. The closer Miyazaki comes to animating "regular" humans, the less compelling I find his aesthetic, so both the characters' images and their behaviors (what's up with the speeding car?) seem to me like missed opportunities. I came awfully close in the first twenty minutes, upon this return trip, to wondering whether I had suggestibly overestimated Spirited Away upon its first release. But unlike Pan's Labyrinth, which enlists a comparably eccentric "otherworld" premise into a flattening partnership with a simplified Good Guys/Bad Guys allegory of fascism and resistance, Spirited Away exalts the young girl Chihiro's uncanny experiences into an adventure that is as thrillingly ambiguous as it is vividly soundtracked and illustrated. Miyazaki is working with a much bolder, often primary palette here than he is in the watercolor-ish Ponyo, but he balances the colors so well and supplies so many visual details that the images are overwhelming without being garish or overcrowded. He makes clear choices among primary preoccupations (Chihiro's loneliness and struggle to be productive, Yubaba's oscillations between menace and begrudging tolerance), privileged supports (the No-Face spirit, the spiderly Kamajii and his factory of treated waters), and chuckly throwaways (the frog, the swarming paper darts who are Yubaba's ensigns) that he has more success than he does in Ponyo, or even in the engagingly ramshackle Howl's Moving Castle, at pushing the limits of graphic and narrative sustainability without losing the key emotional threads or guiding figures for his story. Yubaba herself, introduced through a wry series of delimited body parts, is a triumph of seductive authoritarianism, though her panicked susceptibility to the needs of her enormous infant provide welcome countertones and occasional motives to her public displays of ruthlessness. Her high-octane eruptions into fury and annoyance are usually accompanied by tremendous visual energy and imagination on the film's part, even as her sometime transformations into a swooping condor with a large but fetching Kate Hepburn up-do arrive almost offhandedly: it's simply something she can do. 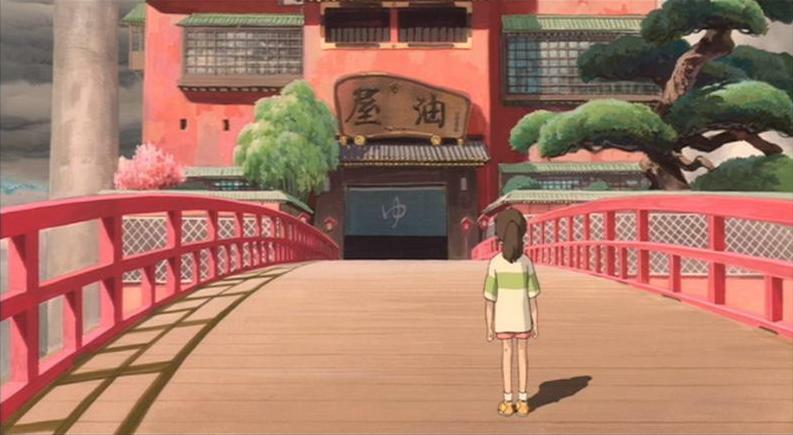 My favorite aspect of Spirited Away is still the way in which Miyazaki uses his knack for wholly idiosyncratic shapeshifting, sometimes paired here with visual translucency, to trouble some essential signals about who is a friend and who a foe to Chihirowho herself has several moments of being her own worst enemy and of superficially testing the audience's sympathy. The No-Face is a prime example of this brave embrace of complexity: first an inscrutable lurker, then a munificent and invisible friend, then a rampaging, carnivorous maniac who comes after everyone, and finally slinking around at Chihiro's heels like a humbled dog who could nonetheles go feral again at any moment. Chihiro's tasks are trickily superimposed: finding her parents and changing them back into humans, finding their way home, learning a new job, making sense of her companions and fairweather friends, assuaging the fiery Yubaba, working through a proto-attraction to the mysterious and changeable Haku. Because Miyazaki entitles each of these figures and plotlines to their own healthy measure of non-transparency, young Chihiro has an exaggerated but nonetheless a fully persuasive experience of adolescent confusion on multiple fronts. She herself is more rounded than the petulant but slightly blank and compulsory Ofelia of Pan's, and I appreciate that Miyazaki insists for so long and in such detail on the ornate workings of the bathhousehas a center of relaxation ever demanded so much dizzying organization and helter-skelter commotion?that it has a freestanding and magisterial integrity beyond its contingent role as a test of Chihiro's mettle. You have a sense that she has truly entered a perplexing, maddening, and magical world, rather than a hunch that an inventive filmmaker has devised some fancy tableaux for her to fumble through on her way to certain triumph.